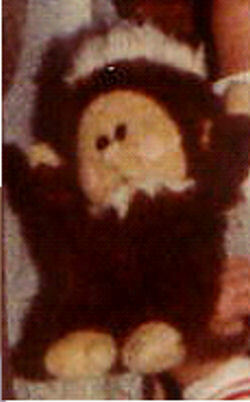 I am searching for this monkey that my sister used to carry around everywhere. We bought it from the Brooks Department Store in Summit, NJ, back in the 80’s. She carried and used that so much that we bought dozens of them and kept switching them. She is now getting married, and I would love to locate that monkey for her. I have no idea who makes it, and I know the pics are not the greatest. He has a red fez sewn on all one piece, with white fur brim. I appreciate your help on this. I will be the world’s best sister if I could find this monkey.. LOL! If you can help Nathalie find this 80’s Brown Monkey with White Fur Trimmed Red Fez, THIS SITE IS NO LONGER ACTIVELY MANAGED. Please use Our FREE FACEBOOK GROUP, including #092908-2 in the subject, .